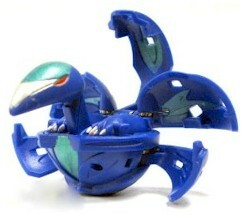 Oberus is the Legendary Ventus Bakugan, the most compassionate of The Six Legendary Bakugan. He has a beak-shaped head and multiple butterfly wings. The Sixth Soldier of Ventus, he is immensely powerful. Oberus can boost its power to defeat an enemy, but can only defeat one opponent at a time in return for the power boost. Purchase Oberus from Amazon now!